When adventure leads you over land and through steams, be ready by gearing up in the Merrell All Out Blaze Sieve water-ready hiking sandal. Waxy, waterproof leather and stretch Lycra neoprene upper materials. Bungee lacing system allows for quick-and-easy adjustments on the go. Protective toe bumper. M Select FRESH antimicrobial treatment helps keep odors under control. Unlined footbed. UniFly midsole provides all-day cushioned comfort. TC5+Vibram outsole with 3 mm lugs delivers reliable traction. Imported. Measurements: Weight: 10.9 oz Product measurements were taken using size 7, width M. Please note that measurements may vary by size. Weight of footwear is based on a single item, not a pair. 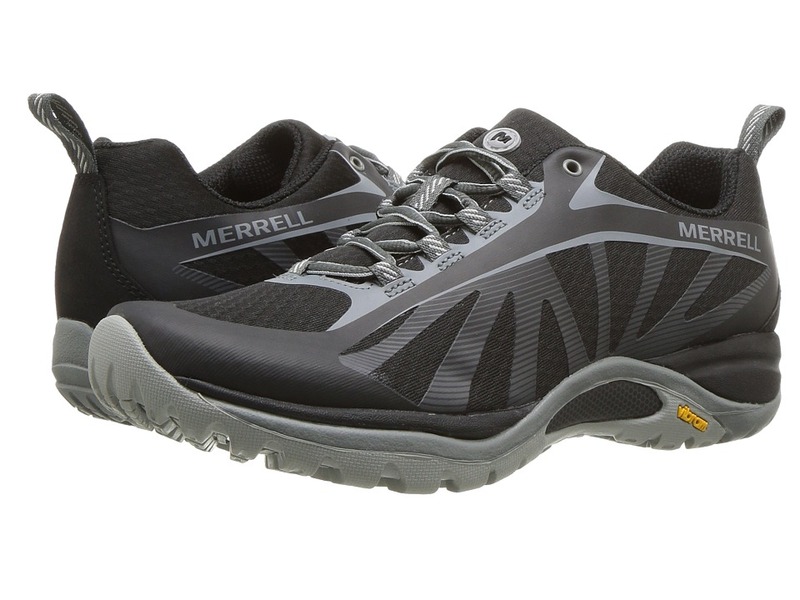 Escape the city and take to the trails in the Merrell All Out Blaze Aero Sport hiking shoe! 100 percent vegan-friendly construction. Breathable mesh and durable synthetic upper materials. 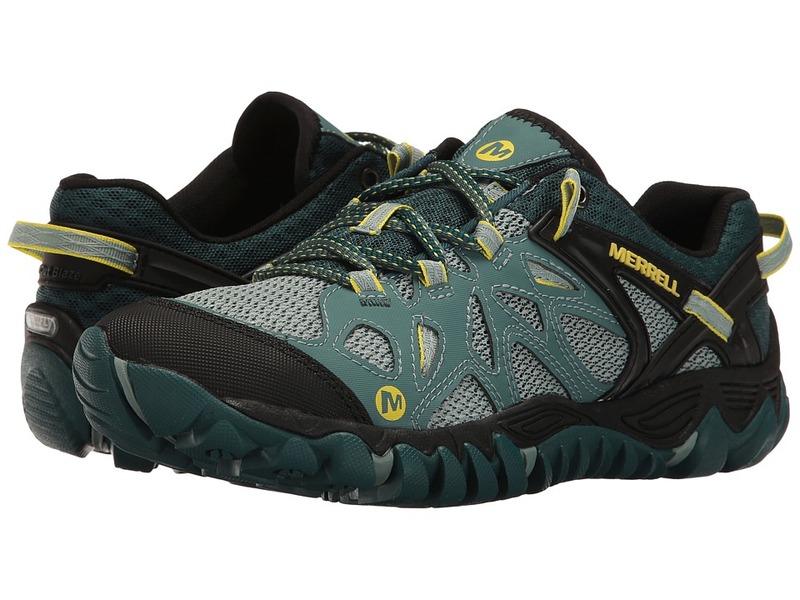 Merrell Omni-Fit lacing system allows for a snug, glove-like fit. Bellows tongue helps keep debris out. Molded TPU heel counter adds stability by locking the foot into place. Contoured tongue and lightly padded collar for next-to-skin comfort. Breathable mesh lining features M Select FRESH technology to help prevent odors. Foam insole. UniFly midsole connects your foot with the trail, and provides cushioning for underfoot protection from the terrain. TC5+ Vibram outsole. 5 mm lug depth. Imported. Measurements: Weight: 9 oz Product measurements were taken using size 7.5, width M. Please note that measurements may vary by size. Weight of footwear is based on a single item, not a pair. When adventure leads you over land and through steams, be ready by gearing up in the Merrell All Out Blaze Sieve water-ready hiking shoe. Waxy, waterproof leather and stretch Lycra neoprene upper materials. Bungee lacing system allows for quick-and-easy adjustments on the go. Protective toe bumper. M Select FRESH antimicrobial treatment helps keep odors under control. Unlined footbed. UniFly midsole provides all-day cushioned comfort. TC5+Vibram outsole with 3 mm lugs delivers reliable traction. Imported. Measurements: Heel Height: 1 in Weight: 9 oz Product measurements were taken using size 8, width M. Please note that measurements may vary by size. Weight of footwear is based on a single item, not a pair. Whether you commute by foot or bike, the Merrell Freewheel Lace sneaker keeps you in comfortable style. Versatile, everyday sneaker features a bike-friendly design. Pig suede uppers. Traditional lace-up style. M Select FRESH technology helps prevent odors before they begin. Pig suede and canvas lining materials. Removable EVA footbed. Merrill air cushion in the heel helps absorb impacting shock, and adds stability. Molded nylon arch shank provides added support. M Select GRIP outsole delivers durable traction and grip. Merrell CycleTread offers rigid mid-foot pedal power, without compromising forefoot flexibility. Imported. Measurements: Weight: 12 oz Product measurements were taken using size 11, width M. Please note that measurements may vary by size. Weight of footwear is based on a single item, not a pair. 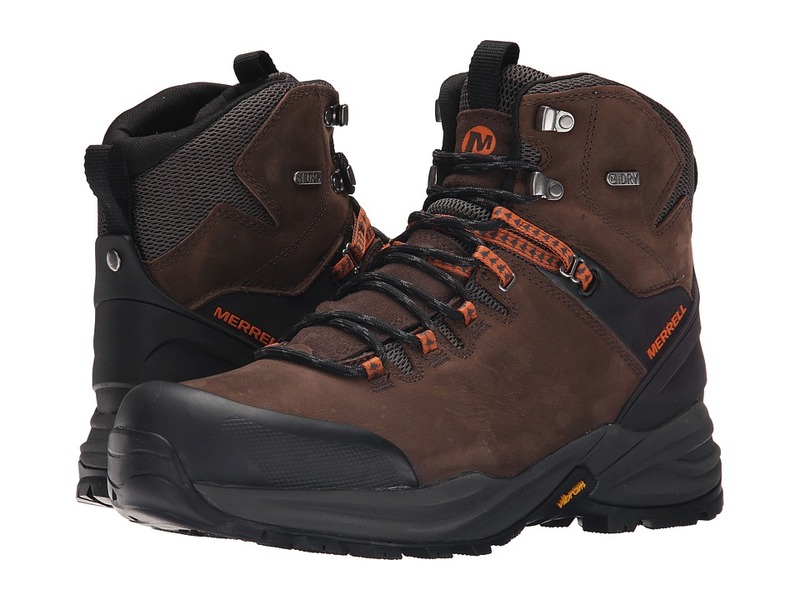 For those extended trips into the wilderness, you~ll need the performance of the Phaserbound Waterproof hiking boot. M SELECT DRY waterproof technology wicks moisture away to keep skin dry. Full grain leather upper. Metal hook and webbing loops for secure lacing. 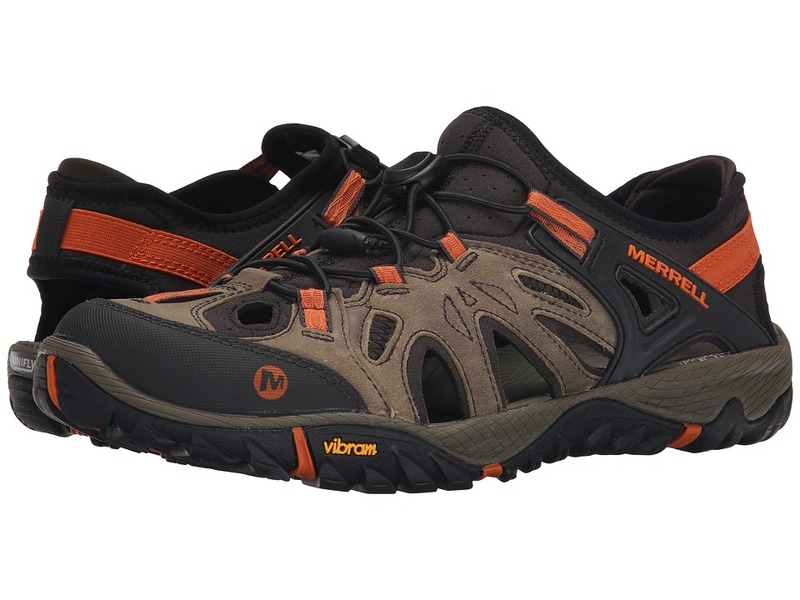 Merrell M Select FIT.ECO blended EVA contoured footbed with organic odor control. External instep and heel stability arm. Vibram TC5+ outsole for all terrain capability. 5.0 mm lug depth. Imported. Measurements: Weight: 1 lb 9 oz Shaft: 6 in Product measurements were taken using size 11.5, width M. Please note that measurements may vary by size. Weight of footwear is based on a single item, not a pair. 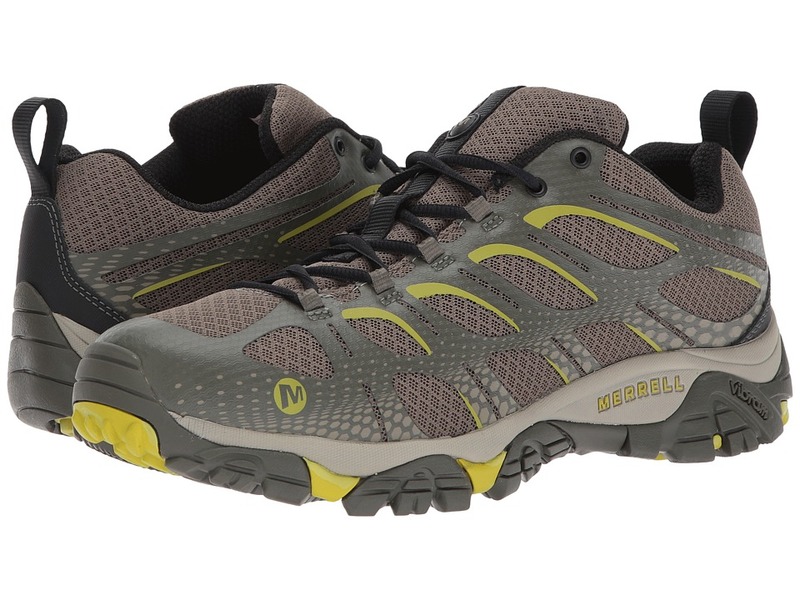 Take your weekend activities outdoors by hitting the trails in the Merrell Moab Edge hiking shoe! Mesh and 3D printed mesh upper materials. Lace-up closure. Heel pull loop. Bellows tongue helps keep debris out. Breathable fabric lining offers a great in-shoe feel. 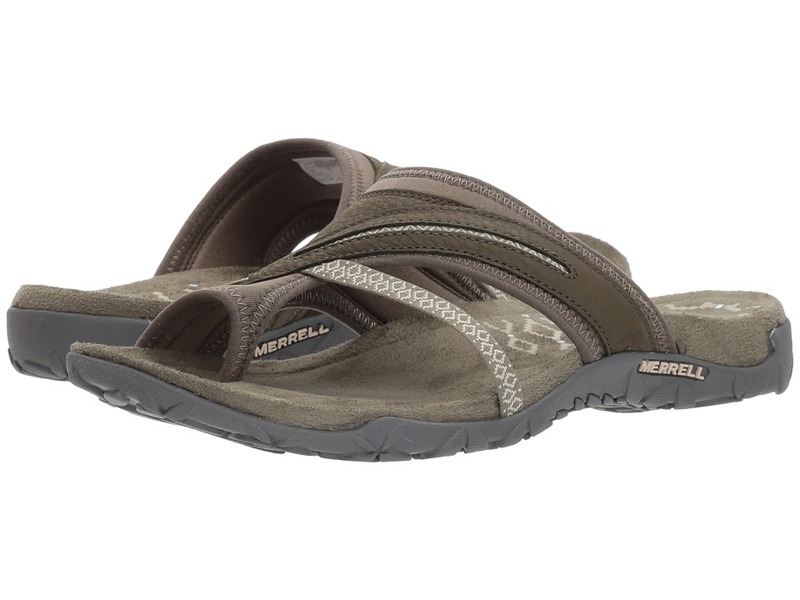 Merrell M SELECT FIT.ECO blended EVA contoured footbed with organic odor control to keep feet feeling fresher for longer. Molded nylon arch shank for added stability. Merrell air cushion in the heel helps absorb impacting shock. Vibram TC5+ outsole delivers unmatched durability, stability, and traction over mixed terrain. Imported. Measurements: Weight: 1 lb 1 oz Product measurements were taken using size 12, width M. Please note that measurements may vary by size. Weight of footwear is based on a single item, not a pair. 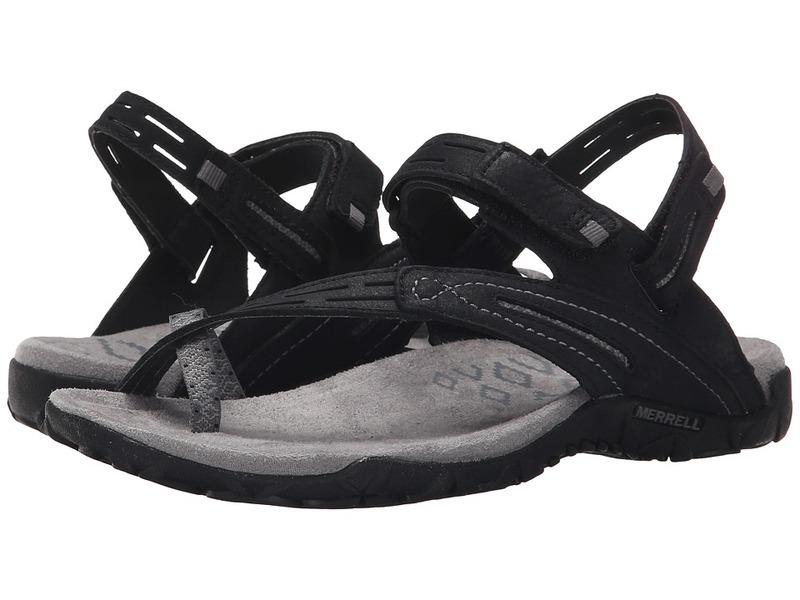 Let your wild side take over with the Merrell All Out Blaze Sieve Convert water-ready sandal! Waxy, waterproof leather and stretch Lycra neoprene upper materials. Three hook-and-loop closure straps for total adjustment. Protective toe bumper. Unlined footbed. UniFly midsole provides all-day cushioned comfort. TC5+Vibram outsole with 3 mm lugs delivers reliable traction. Imported. Measurements: Weight: 10 oz Product measurements were taken using size 9, width M. Please note that measurements may vary by size. Weight of footwear is based on a single item, not a pair. Long days on the trail are no match for the comfort and performance of the Merrell Siren Edge hiking shoe. Mesh and 3D print mesh upper materials. Bellows tongue helps keep debris out. Lace-up closure. Heel pull tab. Plush tongue and collar. Breathable mesh lining. 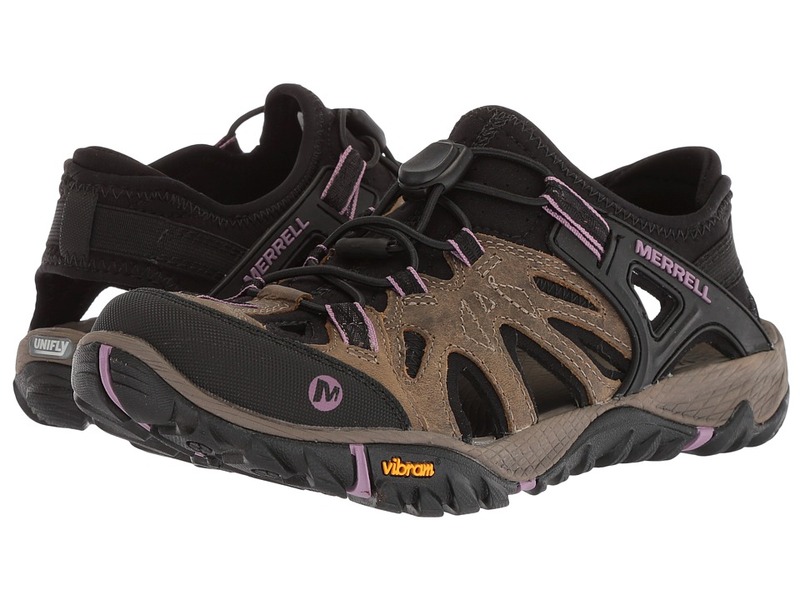 Merrell M SELECT FIT.ECO blended EVA contoured footbed features organic odor control. Merrell air cushion in the heel absorbs impacting shock. Molded nylon arch shank. Vibram high-performance rubber outsole delivers unmatched durability and traction. Imported. Measurements: Weight: 14 oz Product measurements were taken using size 8.5, width M. Please note that measurements may vary by size. Weight of footwear is based on a single item, not a pair. 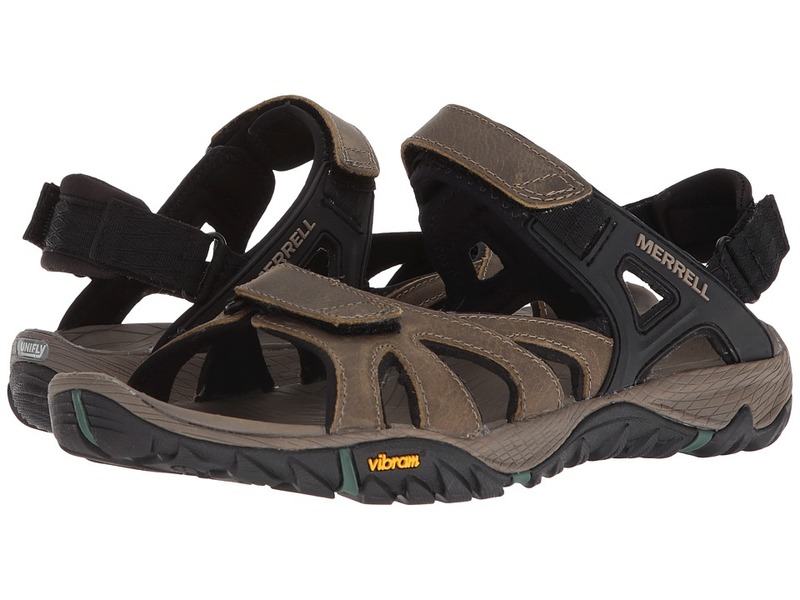 Soft, comfortable and ready for the beach, lake, or sidewalk, the Merrell Terran Convertible II sandals are ready to fit the form of your foot for all-day wear. Nubuck leather upper for easy cleaning. Hook-and-loop closure for secure grip. Removable heel strap. Breathable mesh lining. Soft microfiber footbed. Remember Me foam footbed cradles the foot for lasting comfort. Molded nylon arch shank. Merrell air cushioning in the heel absorbs impacting shock and stability. M SELECT GRIP outsole delivers stability and traction over wet and dry terrain. Imported. Measurements: Weight: 9 oz Product measurements were taken using size 8, width M. Please note that measurements may vary by size. Weight of footwear is based on a single item, not a pair. 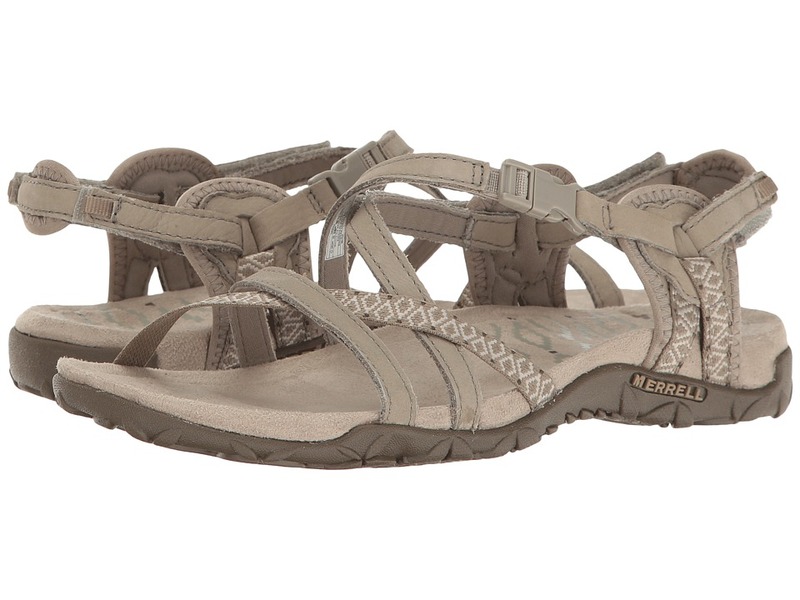 Add a pop of color to your warm-weather look with the Merrell Terran Lattice II sandal. 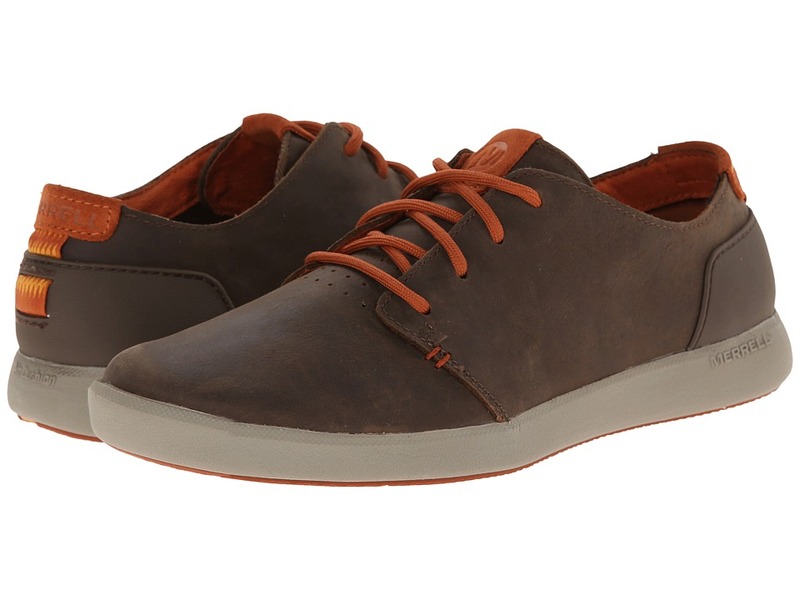 Nubuck leather upper. Hook-and-loop closure allows for easy adjustments. Soft microfiber footbed. Remember Me foam footbed cradles the foot for lasting comfort. Molded nylon arch shank. Merrell air cushioning in the heel absorbs impacting shock and stability. M SELECT GRIP outsole delivers stability and traction over wet and dry terrain. Imported. Measurements: Weight: 7 oz Product measurements were taken using size 8, width M. Please note that measurements may vary by size. Weight of footwear is based on a single item, not a pair. 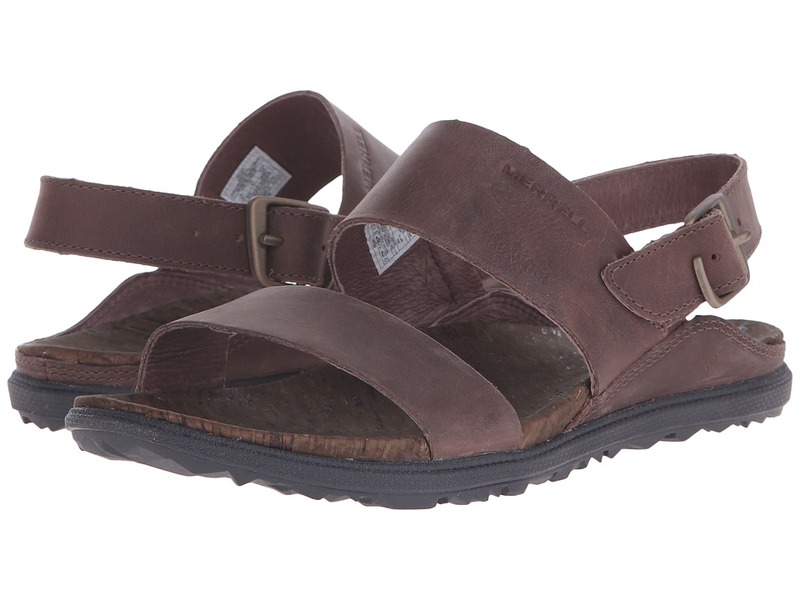 Keep your stride carefree and casual in the Merrell Terrain Post II sandal. Nubuck leather and synthetic upper materials. Easy slip-on style. Lycra Spandex neoprene stretch collar. Breathable mesh lining offers next-to-foot comfort. Soft microfiber footbed top cover with Remember Me foam underfoot. Molded nylon arch shank. Merrell air cushion in the heel absorbs impacting shock and adds stability. M SELECT GRIP outsole delivers durable slip-resistance on wet and dry terrain. Imported. Measurements: Weight: 6 oz Product measurements were taken using size 9, width M. Please note that measurements may vary by size. Weight of footwear is based on a single item, not a pair. 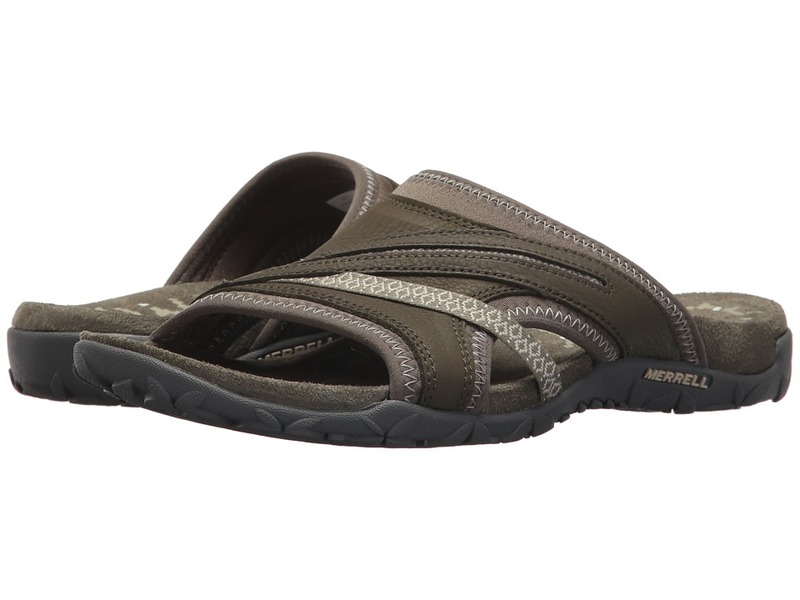 Keep your stride carefree and casual in the Merrell Terrain Slide II sandal. Easy slip-on style. Nubuck leather and synthetic upper materials. Lycra Spandex neoprene stretch collar. Breathable mesh lining offers next-to-foot comfort. Soft microfiber footbed top cover with Remember Me foam underfoot. Molded nylon arch shank. Merrell air cushion in the heel absorbs impacting shock and adds stability. M SELECT GRIP outsole delivers durable slip-resistance on wet and dry terrain. Imported. Measurements: Weight: 7 oz Product measurements were taken using size 8, width M. Please note that measurements may vary by size. Weight of footwear is based on a single item, not a pair. The Around Town Backstrap sandal is street capable as well as train savvy. Rich full grain leather uppers. Pigskin lining for comfort. Adjustable ankle buckle. Comfy cork-covered footbed. M SELECT GRIP outsole delivers durable slip-resistance on wet and dry terrain. Imported. Measurements: Weight: 7 oz Product measurements were taken using size 8, width M. Please note that measurements may vary by size. Weight of footwear is based on a single item, not a pair. Find your next adventure with the Merrell Kids Snow Quest Lite Waterproof! M-Select DRY textile upper is waterproof. Pull cord lace-up construction. Pull-on tab at heel offers an easier on and off wear. M-Select FRESH creates a healthy foot environment with its anti-microbial and anti-odor treatment. thermolite insulation offers warmth and cooling in shoe. Injected molded EVA midsole. M-Select GRIP rubber outsole offers traction and durability. 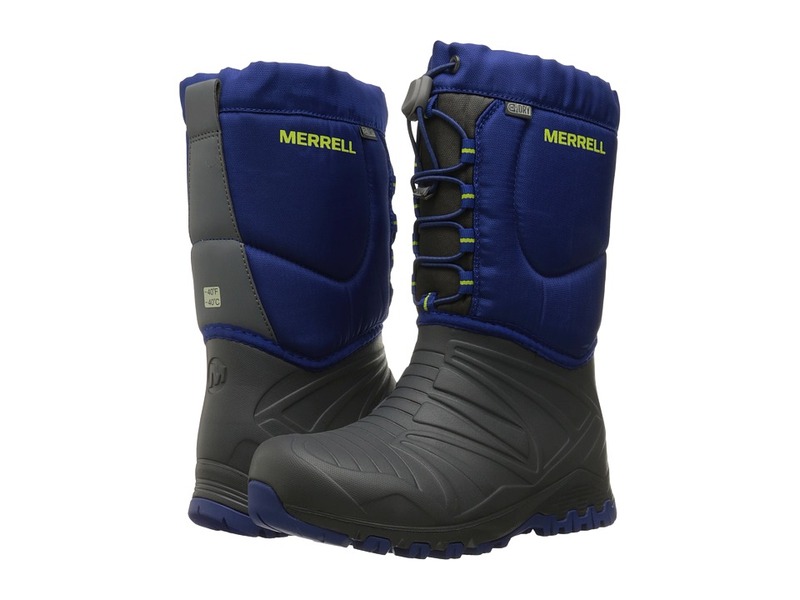 Comfort rated -25&amp#186F/-32&amp#186C Merrell temperature ratings are general guidelines for warmth and comfort. How you feel temperature depends on a variety of factors. At different activity levels individuals will experience different metabolic rates which can be influenced by many other variables such as weather conditions, exposure time, clothing and cold sensitivity. Imported. Measurements: Weight: 13 oz Circumference: 13 1 2 in Shaft: 9 in Product measurements were taken using size 2 Little Kid, width M. Please note that measurements may vary by size. Weight of footwear is based on a single item, not a pair. Find your next adventure with the Merrell Kids Snow Quest Lite Waterproof! M-Select DRY textile upper is waterproof. Pull cord lace-up construction. Pull-on tab at heel offers an easier on and off wear. M-Select FRESH creates a healthy foot environment with its anti-microbial and anti-odor treatment. thermolite insulation offers warmth and cooling in shoe. Injected molded EVA midsole. M-Select GRIP rubber outsole offers traction and durability. Comfort rated -25&amp#186F/-32&amp#186C Merrell temperature ratings are general guidelines for warmth and comfort. How you feel temperature depends on a variety of factors. At different activity levels individuals will experience different metabolic rates which can be influenced by many other variables such as weather conditions, exposure time, clothing and cold sensitivity. Imported. Measurements: Weight: 14 oz Circumference: 11 1 2 in Shaft: 10 in Product measurements were taken using size 4 Big Kid, width M. Please note that measurements may vary by size. Weight of footwear is based on a single item, not a pair. 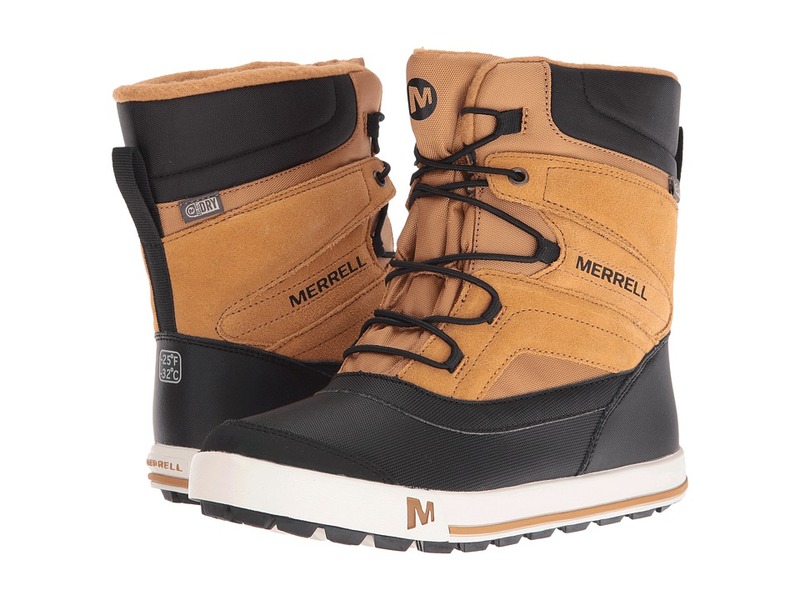 Whether to school or to the snow, the Merrell Kids Snow Bank 2.0 Waterproof Boot can get your kid there while staying toasty and dry! Waterproof synthetic upper. Lace-up closure with toggle offers an easy wear. Pull-on tab at rear provides easier wear. Fun patterned cuff offers style and a pop of color. Soft fabric lining offers a great wear in shoe. M-Select FRESH creates a healthy foot environment by fighting odor-causing bacteria. Non-slip M-Select GRIP rubber outsole creates a steady grip with traction on various surfaces. 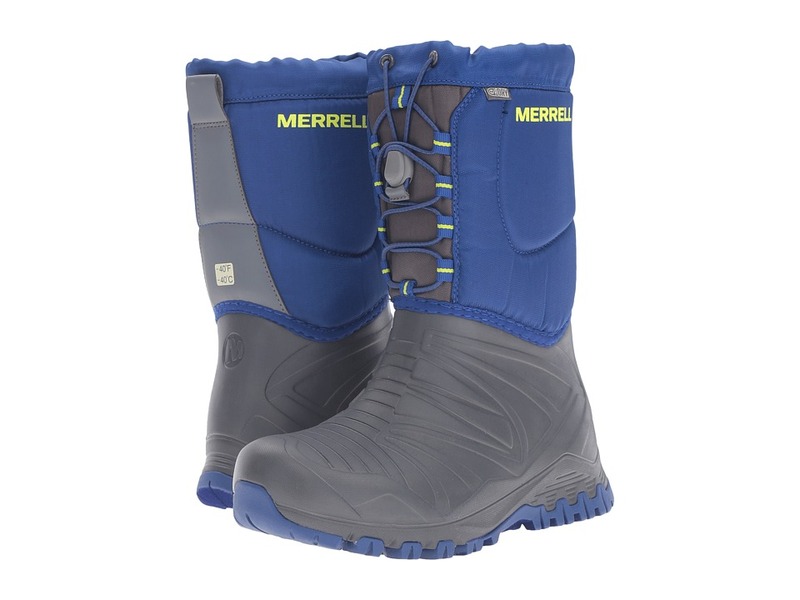 Comfort rated -25&amp#186F/-32&amp#186C Merrell temperature ratings are general guidelines for warmth and comfort. How you feel temperature depends on a variety of factors. At different activity levels individuals will experience different metabolic rates which can be influenced by many other variables such as weather conditions, exposure time, clothing and cold sensitivity. Imported. Measurements: Weight: 13 oz Shaft: 6 in Product measurements were taken using size 2 Little Kid, width M. Please note that measurements may vary by size. Weight of footwear is based on a single item, not a pair. 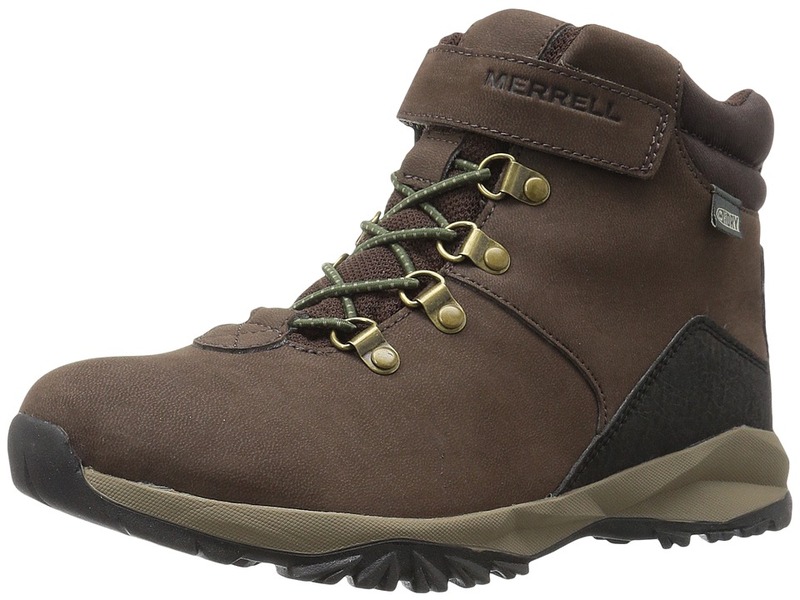 The Merrell Kids Alpine Casual Boot Waterproof is a serious boot ready for some fun adventures! Durable leather upper. Flexible bungee lacing system with single hook-and-loop strap. Plush collar and tongue offers comfort against foot. Pull-on tab at rear for easier on and off wear. Mesh lining for a breathable wear in shoe. Footbed is treated with anti-odor for a healthy foot environment. M-Select GRIP offers great traction. Man-made rubber outsole. Imported. Measurements: Weight: 11 oz Shaft: 4 in Product measurements were taken using size 2 Little Kid, width W. Please note that measurements may vary by size. Weight of footwear is based on a single item, not a pair. 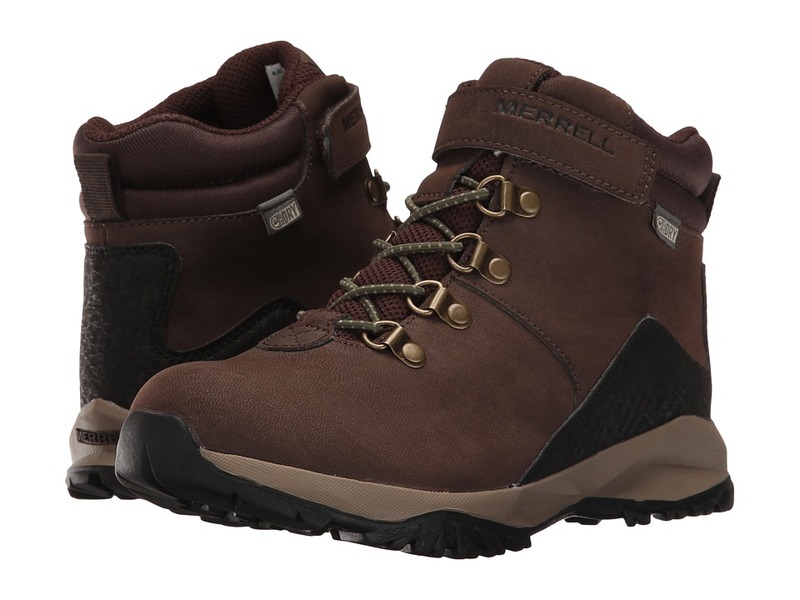 The Merrell Kids Alpine Casual Boot Waterproof is a serious boot ready for some fun adventures! Durable leather upper. Flexible bungee lacing system with single hook-and-loop strap. Plush collar and tongue offers comfort against foot. Pull-on tab at rear for easier on and off wear. Mesh lining for a breathable wear in shoe. Footbed is treated with anti-odor for a healthy foot environment. M-Select GRIP offers great traction. Man-made rubber outsole. Imported. Measurements: Weight: 12 oz Shaft: 5 in Product measurements were taken using size 5 Big Kid, width M. Please note that measurements may vary by size. Weight of footwear is based on a single item, not a pair.